Heat oil in a pan, add all roast items one by one & roast upto golden brown. 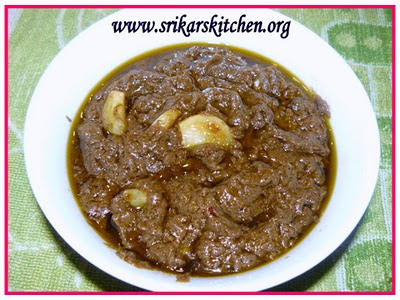 Blend in all roasted spices along with tamarind & hing(asafoetida) to a fine paste. Heat oil in a pan, add mustard seed, garlic sauté few mins. Add ground paste & allow to cook & keep simmering until all oil comes out. i love anything that has garlic as main ingredient. this sounds interesting.Is this a side dish dear? Thxs for ur lovely comments..
Deepa- this is side dish as well as rice mix. looks so yummy, love to have with plain rice and appalam. Nice garlic curry. I like anything garlic. ahh, thats a rich and delicious looking curry..love anything with garlics in it..super yummie! Slurppp!! !irresistible and tempting kuzhambu..with papads , am ready to have some..
Waw! This is my all time favourite kuzhambu. I always love to have it hot with curd rice like pickle.